So, the latest product from the LA-based sound boutique Output is called “Arcade” – so play, get it? And it’s an early entry and fresh take on an area that’s set to heat up fast. To get things rolling here, your first 100 days are completely free; then you pay a monthly subscription rate of $10 a month (with cancellation whenever you want, and you don’t even lose access to your sounds). As the number of producers grows, and the diversity of the music they may want to make seems to grow, too, as genres and niches spill over and transform at Internet speed, the need to deliver music makers sound and inspiration seems a major opportunity. We’re seeing subscription-based models (Native Instruments’ Sounds.com, Splice) and à la carte models (Loopmasters). And we’re seeing different ideas about how to organize releases (around genre, producer, sound house, or more curated selections around a theme), plus how to integrate tools for users. Here’s where Arcade is interesting. It’s really a single, integrated instrument. And its goal is to find you exactly the sound you need, right away, easily — but also to give you the ability to completely transform that sound and make it your own, even loading your own found samples. That’s important, because it bridges the divide between loops as a way of employing someone else’s content, and sound sampling as a DIY, personal affair, with a spectrum in between. I suspect a lot of you reading have been all over that spectrum. Let’s consider even the serious, well-paid producer. You’ve got a tight scoring deadline, and the job needs a really particular sound, and you’re literally counting the minutes and sweating. Or… you’ve got a TV ad spot, and you need to make something sound completely original, and not like any particular preset you’ve heard before. I got to sit down with Output CEO and founder Gregg Lehrman, and we took a deep look at Arcade and had a long talk about what it’s about and what the future of music making might be. We’ll look more in detail at how you can use this as an instrument, but let’s cover what this is. 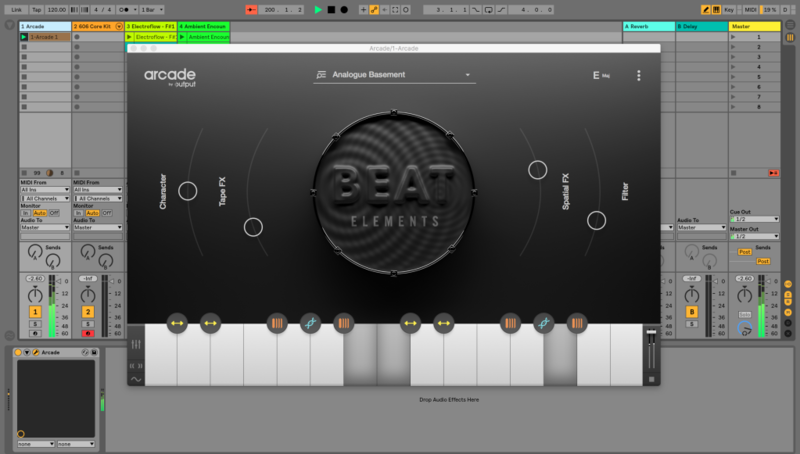 Choose your DAW – here’s Arcade running inside Ableton. Browse through curated collections of sounds, which are paid for by subscription, Spotify/Netflix-style. It lets you find sounds online. 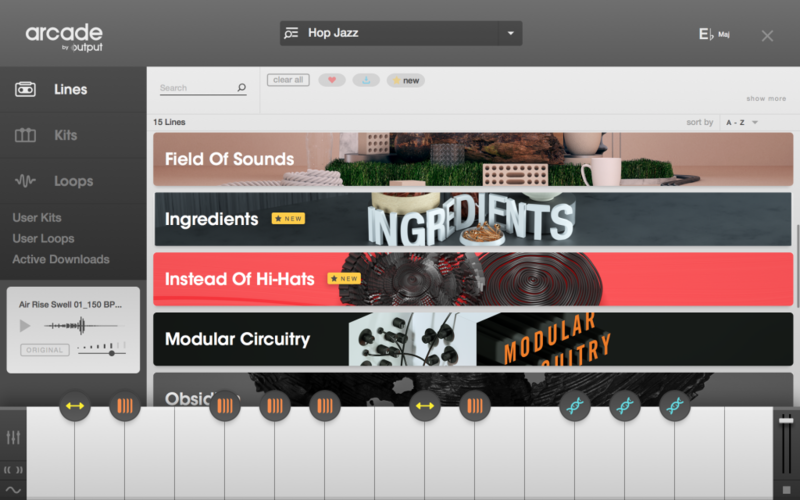 On-demand cloud browsing lets you check out selections of sounds, complete kits, and loops. You can preview all of these right away. Now, Netflix-style, Output promises new stuff every day, so you can browse around for something to inspire you if you’re feeling stuck. And at least in the test, these were organized with a sense of style and character – more like looking at the output of a music label than the usual commodity catalog of samples. Search, browse, tagging, and the usual organizing tools are there, too – but it’s probably the preview and curation that puts this over the top. — but it works if you’re offline, too. Prefer to switch the Internet off in your studio to avoid distractions? Work in an underground bunker, or in the hollowed out volcano island you use as an evil lair? Happily, you don’t need an Internet connection to work. 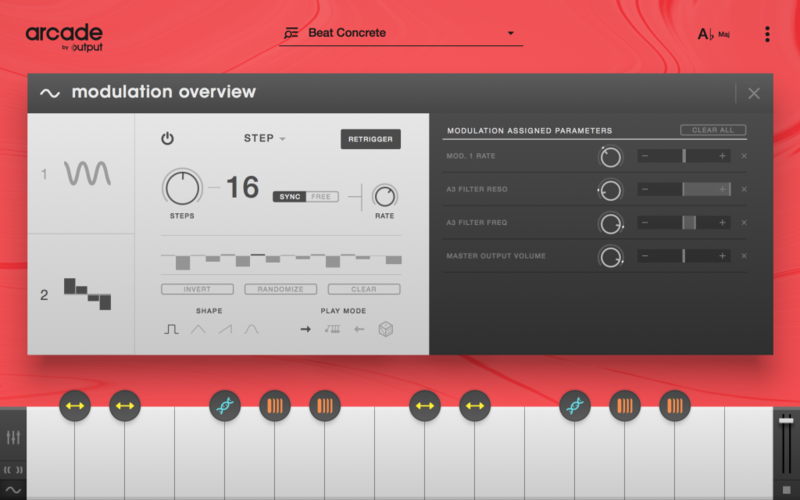 The keyboard (or whatever MIDI controller you’ve mapped) triggers loops, but also manipulates them on the fly. 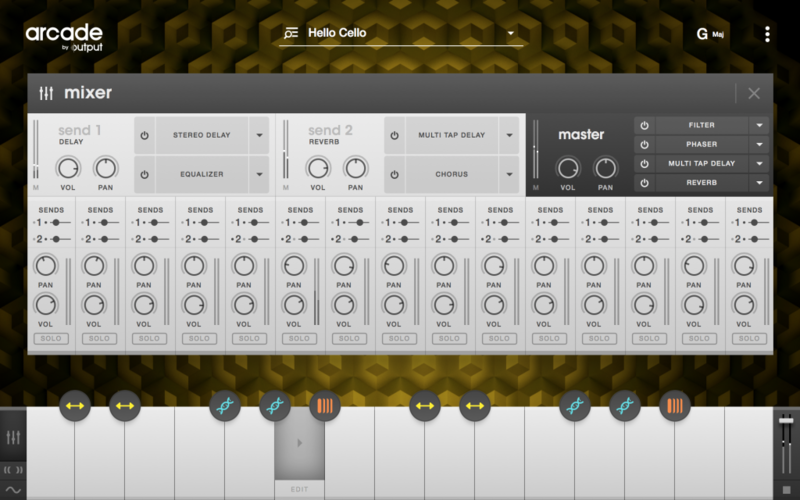 That lets you radically transform samples as you play – including your own sounds. You can play the loops as an instrument. Okay, so the whole reason we went into music presumably is that we love the process of making music. 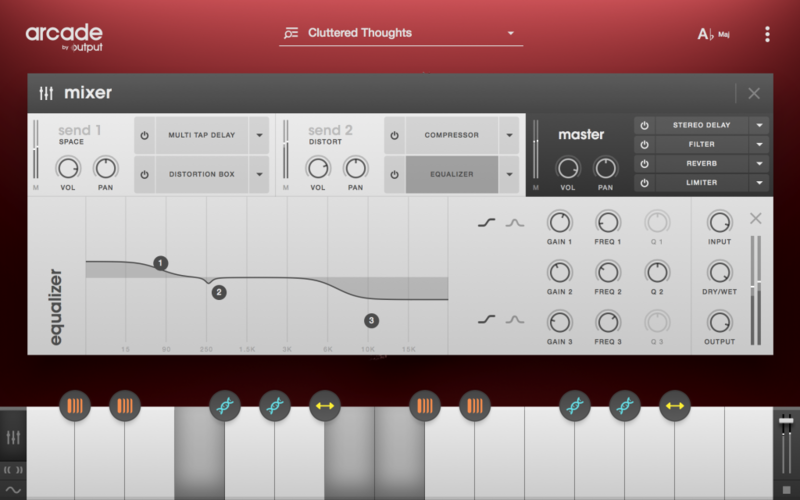 Output excels here by letting you load loops into a 15-voice synth, then mangle and warp and modify the sound. It works really well from a keyboard or other MIDI controller. This isn’t a sample playback instrument in the traditional sense, in terms of how it maps to pitch. Instead, white notes trigger samples, and black notes trigger modifiers. That’s actually really crazy to play around with, because it feels a little like you’re doing production work – the usual mouse-based chores of editing and modifying samples – as you play along, live. There’s also input quantize, in case your keyboard skills aren’t so precise. There are tons of modifiers and modulation and effects. Like all of Output’s products, the recipe is, build a deep architecture, then encapsulate it in an easy interface. That way, you can mess around with a simple control and make massive changes, which gets you discovering possibilities fast, but also go further into the structure if you want to get more specific about your needs, and if you’re willing to invest more time. In this case, Arcade is built around four main sliders that control the character of the sound, both subtle and radical, and then another eleven effects and a deep mixing, routing, and modulation engine underneath. Since the point is playing, you can map to velocity sensitivity, too, so how hard you hit keys impacts filter cutoff and resonance, voulme and formant. Plus there’s a Resequencer for sequencing sound slices into new combinations. 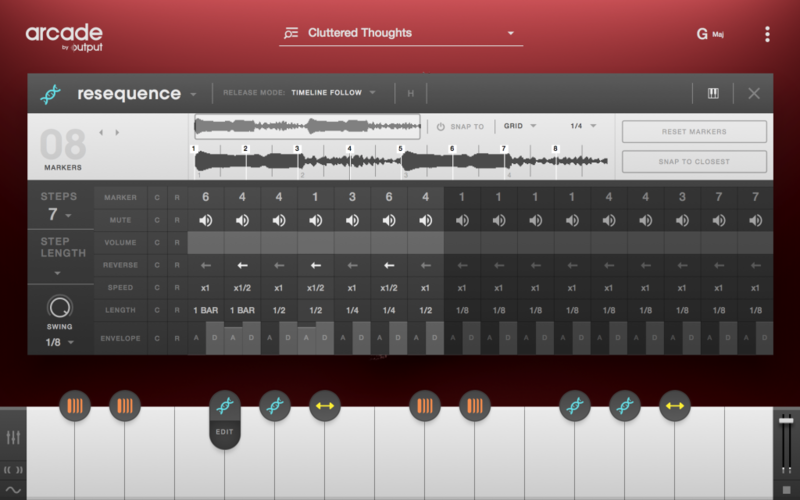 The Resequencer gives you even more options for manipulating audio content and turning it into something new. • LFO/Step (x2) Sync/Free mode with Retrigger and Rate. Deep modulation options either power presets – or your own sound creations, if you’re ready to tinker. The Mixer combines up to 16 parts. It wouldn’t be an Output product without some serious multi-effects options. But if Output likes to pitch itself as the “secret sauce” behind everything from Kendrick Lamar to the soundtracks for Black Panther and Stranger Things, I absolutely adore that you can load your own samples. 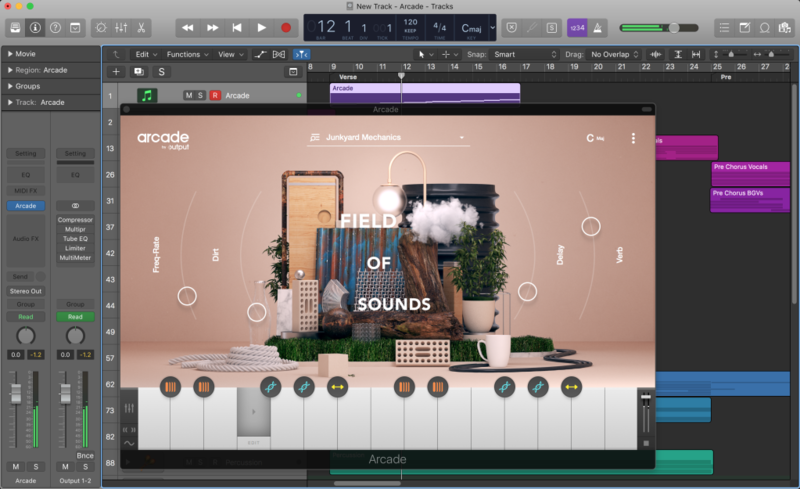 Native Instruments has built a great ecosystem around their tools, including Kontakt – and Output have made use of that engine. 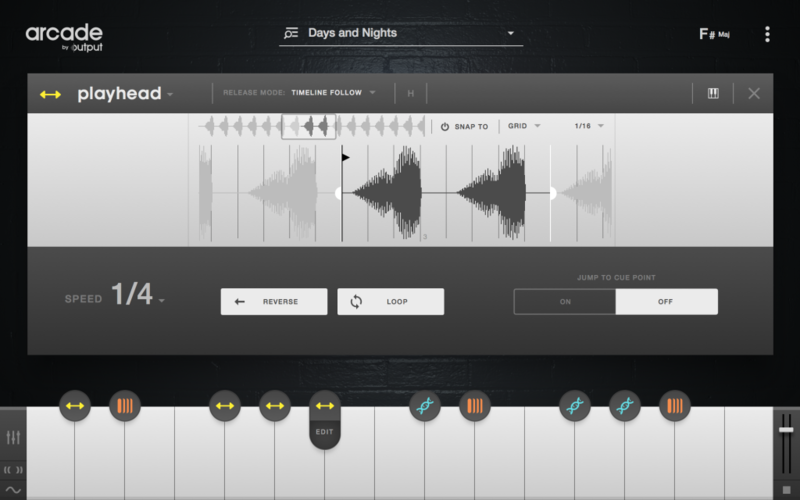 But it’s great to see this ground-up creation that introduces some different paradigms around want to do with sampled sound. That instant access to playing – to tapping into your muscle memory, your improvisation skills – I think could be really transformative. We’ve seen artists like Tim Exile advocate this approach in how he works, and it’s an element in a lot of great improvisers’ electronic work. What Output have done is allow you to combine sound discovery with instant playability. If you open an older session, you will be prompted to log in, and you will not be able to click past the log in screen. You will be able to play back any MIDI or automation data recorded in your saved session. It will sound exactly the same, but you won’t be able to browse or tweak the character of the sound within the plugin. The midi can still be changed as the preset stays loaded in a session as long as you don’t uninstall Arcade which will remove all the audio samples. The best way to see what I mean is to test it yourself. Put ARCADE into a midi track, then log out of the plug-in. 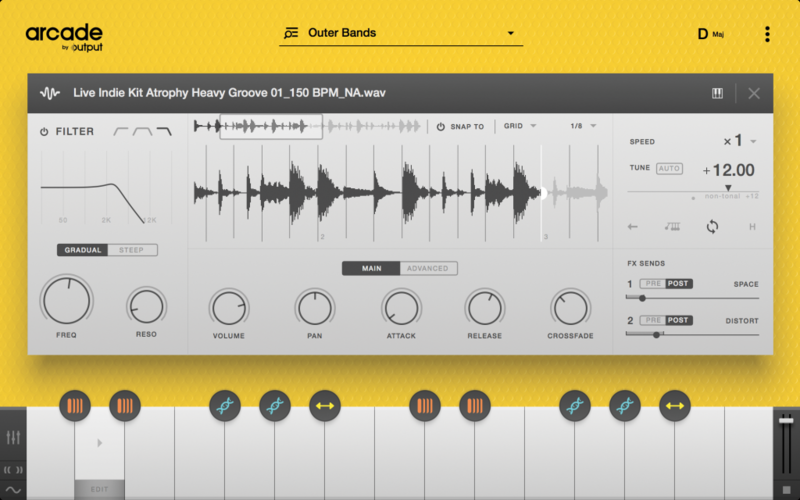 With the GUI still open albeit stuck on the log-in screen, play your track and hit some keys. The fact that it’s all powered by subscription also means you’ll always have something there to use. But I do hope for the sake of sound creators – and because this engine is so cool – that Output also consider à la carte purchasing of some sounds selections. That could support more intensive sound design processes. And the interface looks like it’d work well as a shop, too. I share some of the concerns of sound artists that subscription models could hurt sound design in the way that they have music downloading. And — on the other hand, to use downloading as an example, a lot of us have both a subscription and buy a tone of stuff from Bandcamp, including underground music. I’ll be back with a guide to how to load your own sounds and play this as an instrument / design and modify sounds in a more sophisticated way.